ABOUT THE PRODUCT: Our dog accessories make the perfect gift for any dog lover. And we have an amazing Black Friday special. If you purchase a CuddleMutt collar, you get a signature CuddleMutt blanket FREE. Plus a blanket is donated to a rescue or shelter. BLACK FRIDAY DEAL: Use code “blackfriday” at checkout when purchasing any CuddleMutt collar and a signature CuddleMutt blanket will automatically be added to your order. As a dog foster mom and rescue advocate, I created CuddleMutt to make a difference. CuddleMutt is a vegan dog accessory brand with stylish bandanas, blankets, collars and scarves. For every item purchased, we donate a signature CuddleMutt blanket to a rescue or shelter to provide comfort to a dog in need. Women empowerment is what drew me to MAIA. I try my best to support local, woman owned businesses and MAIA makes it easier. The search functionality by location is my favorite feature; it’s great to see what businesses near me are woman-owned. My favorite way to support women-conscious consumerism is to share woman-owned businesses on my social media. Awareness is key and social media is such a great way to get the word out! 1. Canva (www.canva.com): All CuddleMutt handouts are created on Canva. The platform allows you to easily drag-and-drop into stunning graphics, so all materials look professional and polished. 2. Preview (Phone App): My go to app for planning and designing the CuddleMutt social media Instagram feed, as well as develop content so posts are ready to publish at a moment’s notice. 3. Lightroom (Adobe software): Photo editing software used to make our dog models look their best. This software allows me to efficiently go through the thousands of photos taken and edit so they’re social media ready. 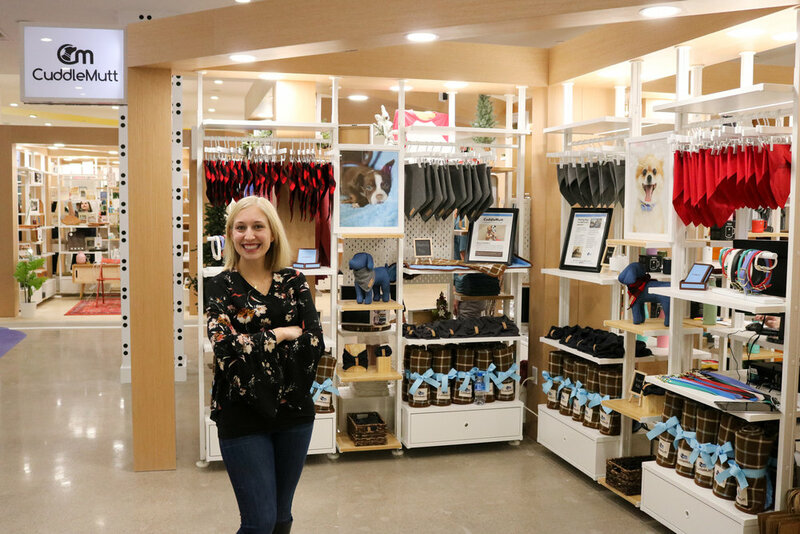 Short Term: We just opened a physical store location at the Mall of America on November 1st. My focus has been on the storefront and preparing for the holiday traffic. Long Term: Increase our wholesale B2B customer base. Which in turn will allow us to reach more shelters with blanket donations nationwide. Lori Greiner, from Shark Tank, is one of my idols. I am inspired by Lori’s entrepreneurship drive, her influence on woman empowerment and her compassion to help others.